A Squatty Potty. A club for dollar razors. A box that comes to your home filled with curated clothes. All of these businesses and ideas started with the help of a beautifully designed eCommerce website. That’s the only way to go about getting the word out about your product, and the best method to do so is with a solid WordPress theme. Seeing as how WooCommerce is by far the top eCommerce plugin for integrating with WordPress and launching your online store, it seems suitable that the market is filled with themes just for the WooCommerce plugin. Not only that, but many startups are pressed for cash, so developers have worked hard to create stunning free WooCommerce themes that you can download with the click of a button. The best part? Many of the themes are ripe for upgrading, so if your business scales up fast where you need more flexibility or better branding, you can always swap out one of the free WooCommerce themes for a premium one. Therefore, keep reading to learn more about your best options, and feel free to bookmark this page if you’re planning on starting more WooCommerce shops in the future. 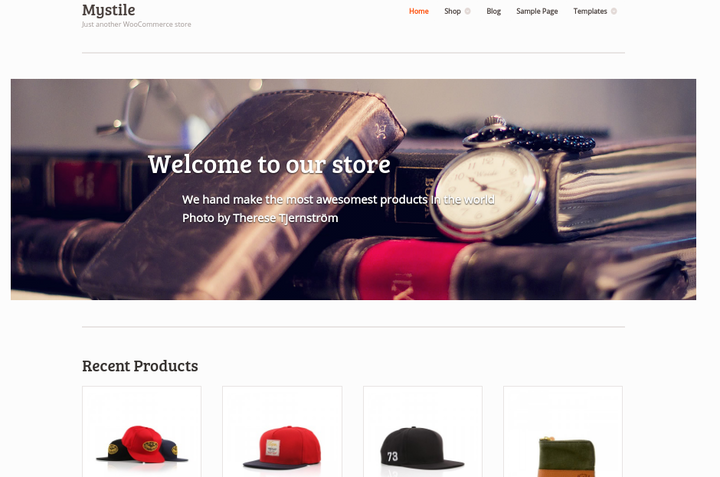 The Mystile WordPress theme delivers a simple, yet charming take on the average WooCommerce theme, since it provides a clean header and menu, along with a solid place to share your recent products right below the header. It’s a rather lightweight option provided by the WooThemes team, and you’ll find that it has plenty of color schemes and a responsive layout for mobile devices. As you may have assumed, the theme is built for the WooCommerce integration, so uploading products takes just a few minutes, and you receive a wide range of widgets for placing them on your site. 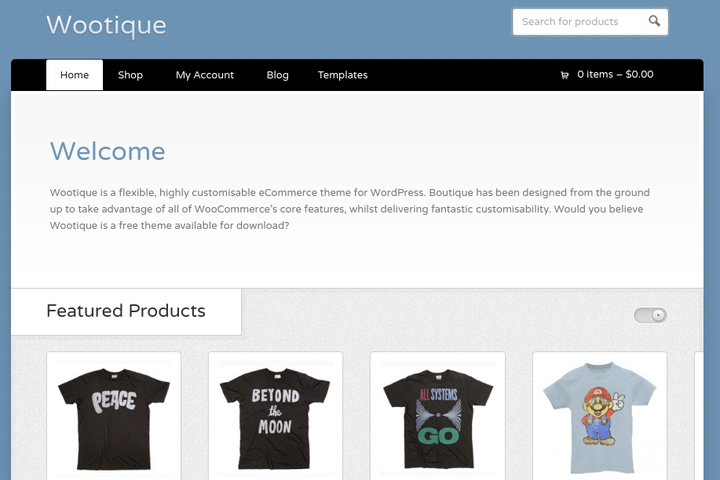 Wootique comes from WooThemes as well, with the ability to utilize all of the useful features that come with WooCommerce. It’s a free solution offered for immediate download, and you’ll find that the customization options are rather impressive for not having to pay any money. First of all, you can change the background colors for branding, while also modifying the menu and footer for navigation and widgets. The custom slider works well for promotions and events, and we particularly enjoy the eight custom widgets. 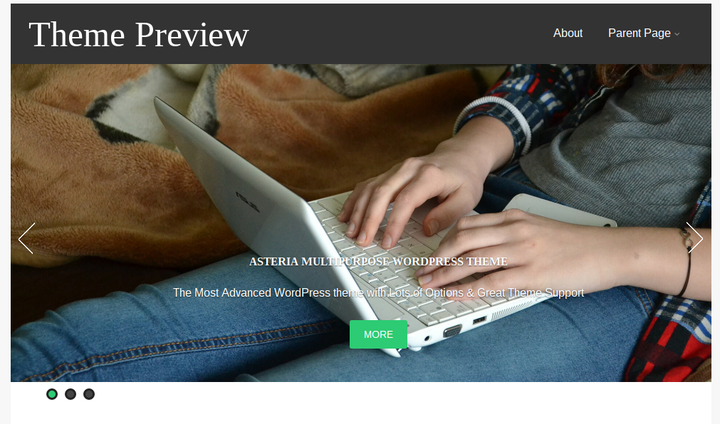 Check out the Asteria Lite WordPress theme if you’re interested in portraying both business information and products. 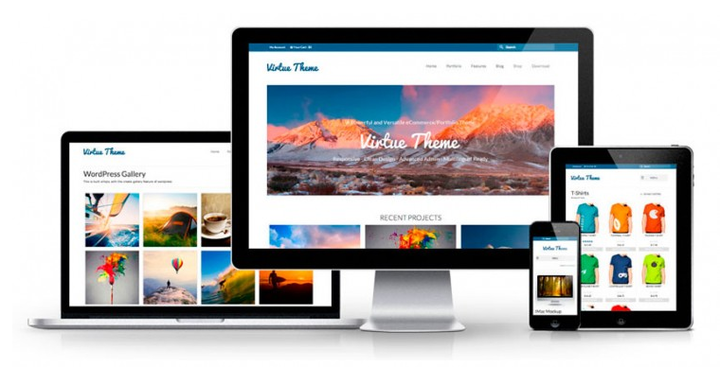 The theme features a beautiful header module that slides around with multiple high resolution pictures. It incorporates overlaying text and buttons for call to actions, and the responsive nature of the theme snaps all elements into place within a moment’s notice. Over 600 fonts grace the backend, but one of the coolest parts is that a maintenance mode feature is packaged into the theme. 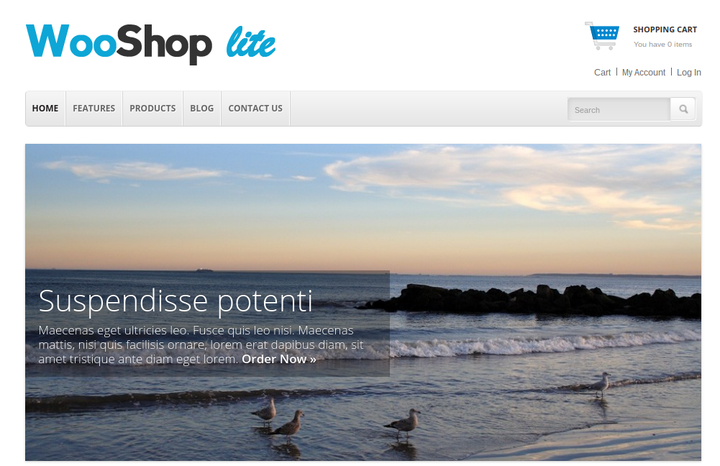 Many companies consider the WooShop Lite WordPress theme when looking for a free WooCommerce theme with shortcodes. These shortcodes make items like buttons and columns, all without having for you to touch any source code. In addition, the responsive design is essential for people to buy from your store on mobile devices. The background customizations work nicely, while the multi-level dropdown menu is something that you generally only receive in premium themes. Along with a blog page and unbranded theme options, you can’t go wrong with the WooShop Lite theme. The Artificer WordPress theme offers a decent responsive design, and it also is made by the folks at WooThemes. Several color schemes are provided for branding your website, so it doesn’t take long to match up the website with your brand identity. 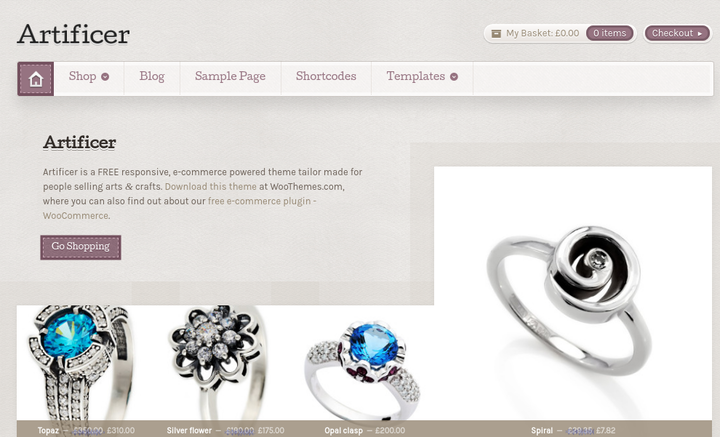 The custom homepage is the standout feature considering you can show off latest blog posts and product galleries. Shortcodes are packaged into the theme for quick designs, and one of them gives you a nice sale banner for telling people when you have a promotion. 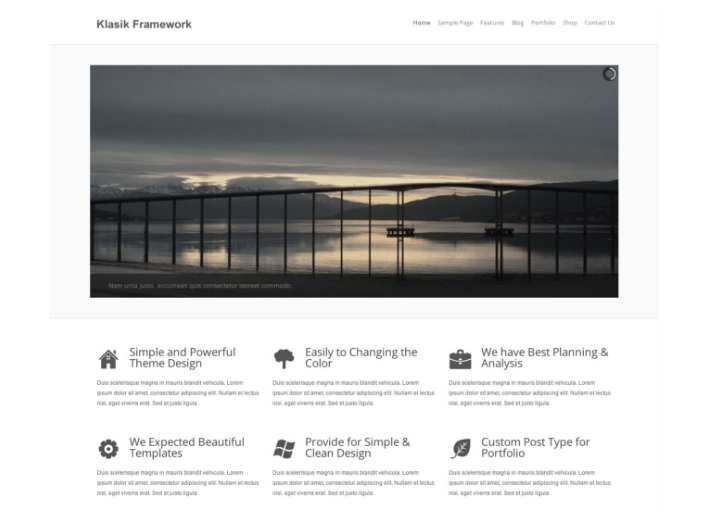 The Klasik WordPress theme can actually be used for a wide range of websites including portfolios and blogs. This is rather good news because most eCommerce sites are going to want a blog as well, and potentially a portfolio. The twelve custom widgets combine well with the six widget areas, opening up quite a few options for designing the layout of your homepage. The theme is completely responsive with standard WooCommerce compatibility, and it includes translation files for when you want to go global with your sales. Fruitful has plenty of wonderful reviews, making it a rather appealing solution for companies looking for creative online stores. The icons and text both look somewhat playful, and you even receive some social media buttons for sending folks to places like Facebook and Twitter. The simple and clean frontend design ensures a quality user experience, while the background and color editing ensures your ability to boost your brand image. This is one of our favorites, so download it today and give it a try. TheShop comes from the fine people at AThemes, and it has a custom frontpage, fonts and colors. Responsiveness makes for a great mobile experience, and the two menus are one of those features that are not all that common for free themes. The slider for your header has a wonderful impact on your customers, and it supports all of your high resolution images. 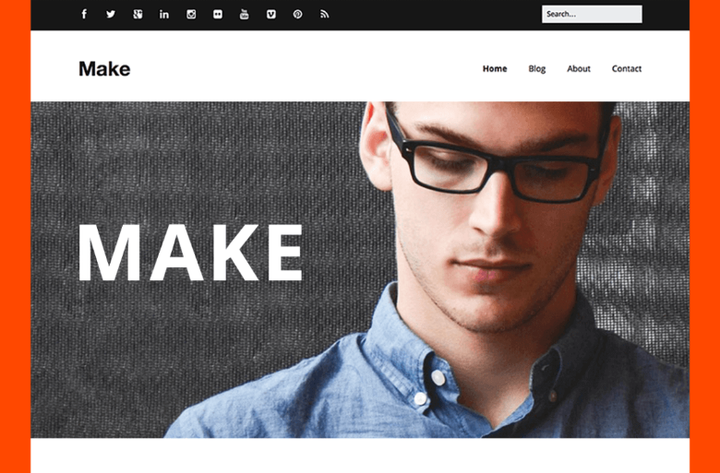 Along with an easy setup, Google Fonts and plenty of blog options, TheShop packs quite the punch for a lightweight theme. As you can see from the screenshot above, the ShopIsle theme is completely responsive, making it fit onto just about any type of screen. 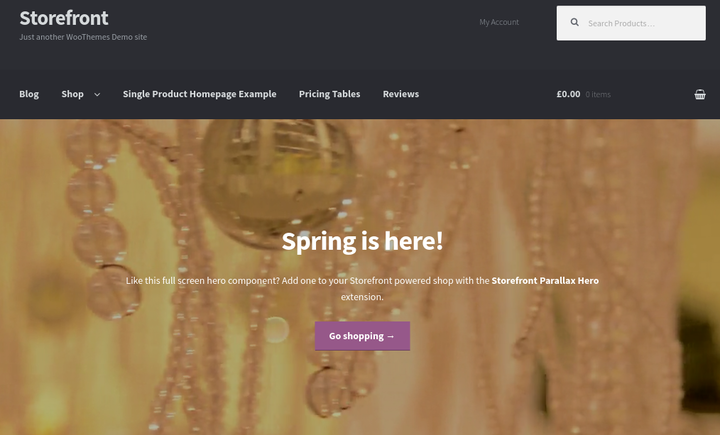 You won’t find a more elegant WooCommerce theme on the market, considering you get plenty of free space and an awesome contact form for keeping in touch with customers. The About Us page reveals information about the people working for you, and the beautiful header is yet one of the many premium tools packed into the ShopIsle WordPress theme. It makes sense that WooThemes makes some of the best WooCommerce solutions out there, and this one is no exception. It’s intuitive and flexible with one of the highest performing interfaces on this list. The whole point of the StoreFront WordPress theme is to remain clean and lean, so no shortcodes, sliders or page builders are included with the package. You’ll still get responsiveness, a basic homepage template and quite a bit more, but this one is truly for those who want a simple site. 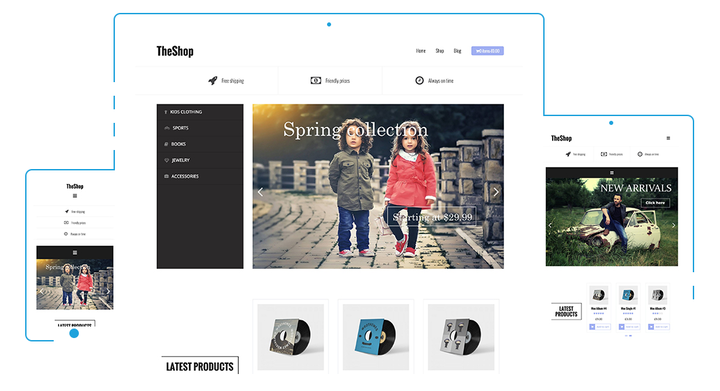 The AccessPress Store theme delivers a quality customizer for changing around colors, fonts and images. The beautiful product page outlines details for each product, along with images, descriptions and pricing. A powerful slider grabs attention and sends people to certain landing pages and promotional listings, while the several images on the homepage can be used as banners. The EightStore Lite theme provides color, imagery and style, since it’s packed with banners for promotions, a slider and beautiful menus. Building an online store is fairly easy, considering you have access to YouTube integration, a product slider and an advanced wishlist. The promo ticker serves as one of our favorite features because you can constantly keep your customer updated about what’s new and on sale. The bbPress compatibility is impressive, and the fully responsive design keeps your typography and imagery in check while people are searching your site on the go. As you can see from the Make theme image above, social media buttons come along with the download. 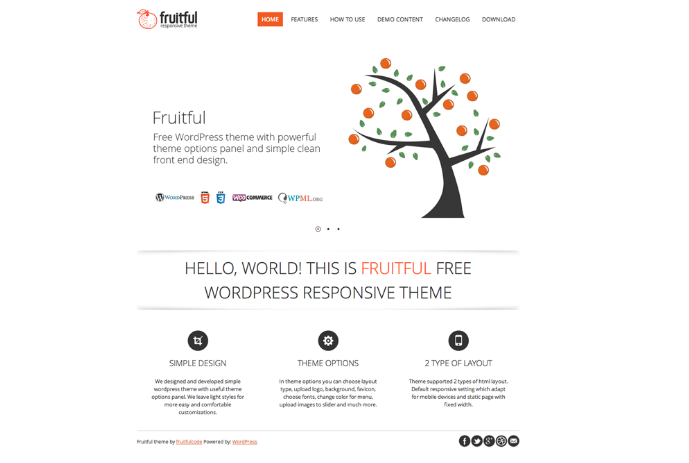 It’s one of the more flexible solutions, and the coloring is on par with most premium themes. The page layout designs are all managed through the WordPress customizer, where you can add anything from page sliders to banners. The theme developers made a partnership with Adobe Typekit, so the typography is solid, while the Google Fonts are not too shabby either. The Virtue WordPress theme has an extremely versatile responsive design, with translation ready files and stunning sliders for the ultimate presentation. Custom fonts are there for beginners and advanced users to meet their brand expectations, and the custom CSS module is always around if you’d like to get really creative with your design. The slider supports high resolution images, and the shop resides on a completely different page. Don’t fret though, because all of your featured products remain in a slider on the homepage. The Shophistic Lite presents beauty and elegance into the free WooCommerce theme market, with all of your products remaining right on the homepage, almost looking similar to a portfolio or Pinterest. Change around your logos, colors and fonts on the dashboard, and use the CSS animations to stand out from the crowd. 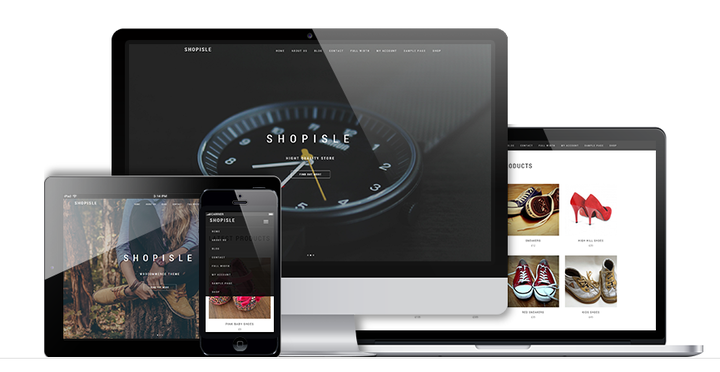 Along with translation files and a responsive layout, the Shophistic Lite WordPress theme is no slouch. All of the best free WooCommerce themes are lightweight, responsive and product-friendly, so when we put together this list that’s what we were thinking. Obviously a beautiful design is important as well, so we tried our hardest to locate only the best for this list. If you have any questions about which of the free WooCommerce themes you should choose from, feel free to let us know in the comments section below.